The Dalits of Uttar Pradesh and, by extension, India, are better off because of India’s visible adoption of economic reforms in the early 1990s, according to a recent study that has set off a debate on whether economic progress can structurally alter the country’s caste system. The study, conducted by the Centre for the Advanced Study of India (Casi) of the University of Pennsylvania, covered 19,071 Dalit households in Bilariaganj and Khurja blocks in Uttar Pradesh, and seeks to prove that many of these households have improved since 1990. In terms of product ownership, between 1990 and 2007, the proportion of Dalit households in the sample with a television set jumped from 0.8% to 34%. And the number of Dalits in the sample making a livelihood by removing the carcasses of animals—considered impure in most parts of India and, hence, a task once reserved for Dalits—has fallen from 39.9% to 2.4% in the same period. The study has its share of supporters including Narendra Jadhav, a Dalit, and a member of the Planning Commission, and Dalit activist Ram Kumar. “The market changed it all. The process of liberalization after 1990 brought with it a regime which was blind to caste and religion. Talent and hard work mattered above all. We saw the change happening. Things started improving back in the village with the remittances sent by us," says Ram Kumar, who was once thrown out of his school for daring to share water with his so-called upper-caste classmates. “We have seen the study and the results of this survey vindicates the stand of many including me. Liberalization and the market economy gave an opportunity to the untouchable of country to break the established norms of villages and work with dignity. The process still continues," says Jadhav. “Behavioural and lifestyle changes are natural with time and circumstances," says Vivek Kumar, associate professor at the Centre for the Study of Social Systems, Jawaharlal Nehru University who adds that the question of the impact of liberalization on the caste system remains open. “The market ushers in the change for the sake of its profit and for expanding its consumer base. The process of social change cannot be left to the mercy of the market," he says. Vivek Kumar also adds that Bilariaganj, one of the two locations where the survey was carried out, has a high density of semi-skilled workers and that the migration of such people to towns is a natural phenomenon, irrespective of the process of liberalization. The study was commissioned by Casi to a team of four, Devesh Kapur, head of Casi, Chandra Bhan Prasad, a Dalit researcher and writer based in Delhi, Lant Pritchett of Harvard University and D. Shyam Babu of the Rajiv Gandhi Foundation. “After my tenure as a visiting fellow in the University of Pennsylvania, I started with this study which had a very unconventional approach, which classical economist may not accept. We asked every Dalit family of two blocks in Uttar Pradesh to respond on the occupational and lifestyle changes between 1990 and 2007. The methodology could be questioned but the change is evident on the ground," says Prasad. The Casi study was conducted in early 2008 and its findings are yet to be released. Casi has also tried to strengthen its study by juxtaposing with it the findings of an earlier study (conducted in 2008) that looked at the employees of three malls in east Delhi and its environs. That study had found that of 427 people surveyed, 76 were Dalits. And just around one-third of people responsible for the cleanliness of the mall—Dalits, most people in India still believe, are largely in “cleaning jobs"—were Dalits. 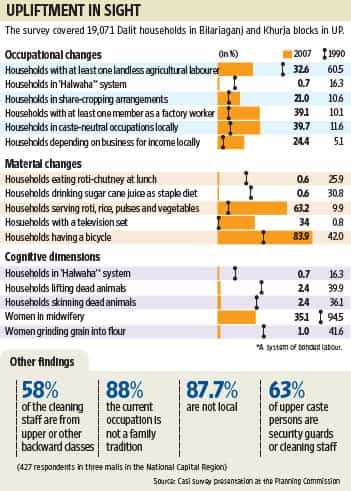 “The notion of Dalits being the ones responsible for the cleaning jobs is also shattered by this survey. Of the 151 cleaning staff among the respondents, surprisingly, only 58 of them wereDalits while another 58 were from the general caste and 30 and five, respectively, of the OBC (other backward classes) and ST (schedued tribes) class," says Prasad. The findings of the Casi study were presented to the Planning Commission in early November, but Jadhav says it is “too early" to see if these have any impact on government policies. Even as the debate over the study continues to rage, however, Dalit activist Ram Kumar sees another side to the findings. “Without skill development and proper stress on education, now there is risk of Dalits in cities being treated worse than in villages," he says. “The market is cruel and insensitive."